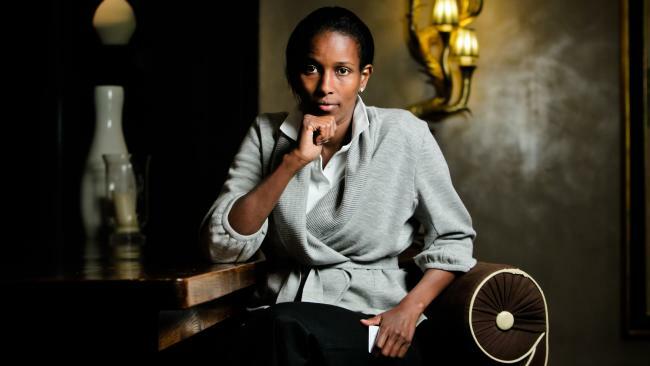 Ayaan Hirsi Ali is coming to ­Australia soon to speak about ­reforming traditional Islam and confronting militant Islam. There are people and organisations trying to prevent her from coming or speaking. They describe her as an “extremist” who engages in “hate speech”. They are in error. She must be allowed both to come here and to speak. Over the past week, the organisation hosting her — Think Inc — has been harassed. Its insurers have been contacted and warned there could be trouble. Venues where she is scheduled to speak have been contacted, warned there will be protests and urged to cancel her engagements. Bill Leak, were he still with us, would have had a field day with this. Much of this has been done by an individual called Syed Murtaza Hussain of the Council for the Prevention of Islamophobia Inc. He informed Festival Hall in Melbourne there would be 5000 protesters outside the venue if the engagement went ahead. There have been other initiatives, including an abortive appeal on Change.org to prevent Ali from speaking. Think Inc is the budding creation of two very fine young Australian entrepreneurs, Suzi Jamil and Desh Amila. They bring top class speakers here, covering the spectrum of both the natural ­sciences and public affairs. They don’t shrink from controversy. Cosmologists Brian Greene and Lisa Randall have been among their speakers. So have Julian ­Assange and Edward Snowden — by video link. There were no demonstrations in any of these cases. Why should there be in Ayaan Hirsi Ali’s case? She is a woman of Somali origin who fled from Islam and has written and spoken as a trenchant critic of it, first from Holland and more recently from the United States. Her books, The Caged Virgin (2006), Infidel (2007), Nomad (2010), and Heretic (2015) have rightly made her a celebrity speaker. I have met her and heard her speak. She is dignified, articulate, courageous and well worth listening to on the challenge that Islam presents to the world at large. The Muslim Brotherhood, the Council on American Islamic ­Relations and the Organisation of Islamic Cooperation, all powerful international organisations, see her as a dangerous enemy and are determined to silence her. They have enlisted allies, strangely enough, on the regressive Left, who insist that criticism of Islam is in and of itself a kind of “Orientalist” or “neo-colonial” phenomenon and should be denounced as racist and bigoted. This strange ­alliance of conservative Muslims and self-styled Leftist “progressives” has been conducting a campaign to attack, discredit and silence Ali. There are two fundamental things at stake here: first, the empirical question about the realities of Islam and second, the right to freedom of speech. If what Ali stands for and has written is not accurate in any point of detail, there is no reason why it cannot be challenged or corrected. This would be the case even if she really was an “extremist”. As it happens, she is largely correct in her criticisms of Islam and the attempt to silence her — which has long included relentless threats of violence — is not only misguided, but downright sinister. She has never stirred up a mob or issued threats of violence. She has fought exclusively with the pen, not with the sword. Her enemies would like to deny her these things. Let’s be clear that there is plenty to criticise in Islam and that the freedom to engage in such criticism is suppressed across the Muslim world. The OIC and other Muslim groups are striving to suppress any criticism. They must not succeed. Ali particularly angers them because she is a ­former Muslim, a woman, dark skinned and therefore one of the Left’s “oppressed”, highly articulate and brave enough to have ­declared herself not only an apostate from Islam, but an atheist. The Koran and Muslim tradition punish these things with death sentences. Ali ought to be lionised for her courage and her defence of both women’s rights and the rights of Muslims generally to liberty and freedom of expression. Instead, she is denounced as an enemy of tolerance and the open society. She is anything but those things. In a liberal society one is free to choose and to change one’s ­religion, one is free to not adhere to any religion and one is free to ­inquire, read, speak and write ­critically of religions, political ­ideologies and other matters, ­including law and morals. Wherever Islam — whether Sunni or Shia — rules, however, it makes itself an exception to such liberties. Its militant adherents are actively seeking to extend that regime of religious exceptionalism and intolerance in the Western democracies by attempting to ban any criticism of Islam. Ali opposes them candidly and they deeply resent the fact that she has been finding an audience. We must insist on her freedom of speech and resist efforts to censor or intimidate her. Paul Monk is a former senior intelligence analyst, an author and a member of the editorial board for the Rationalist Society.